The recently proposed term “problematic severe asthma” (PSA)  describes children with persistent symptoms and/or severe exacerbations despite high dose treatment . They suffer significant morbidity and consume a disproportionate amount of healthcare resources. Children with PSA are heterogeneous with respect to lung function  and asthma phenotype  and warrant careful evaluation. PSA  encompasses 1) wrong diagnosis; 2) significant comorbidities; 3) difficult asthma with potentially reversible factors such as poor inhaler technique, ongoing allergen exposure or poor adherence to treatment ; and 4) severe therapy-resistant asthma (STRA) that is refractory to maximal treatment despite optimised standard management . PSA children were enrolled in a staged assessment protocol to differentiate difficult asthma from STRA . The different stages were as follows. Stage 1: a detailed re-evaluation of the child including a nurse-led outpatient assessment with evaluation of inhaler device and technique, psychosocial questionnaire, a home and school visit, an assessment of adherence including prescription uptake check and a final multidisciplinary team discussion to decide whether the child had difficult asthma or STRA . Stages 2 and 3: children identified as STRA progressed to invasive investigations including bronchoscopy and assessment of steroid response . Differentiating difficult asthma from STRA is important to avoid unnecessary invasive procedures and side effects from additional treatments such as methotrexate. Furthermore, the healthcare costs of these approaches cannot be justified if simply improving basic management may improve asthma control. There have been no longitudinal studies that have assessed the long-term efficacy of a staged assessment of paediatric PSA. We hypothesised that the stage 1 assessment distinguishes difficult asthma from STRA and results in a sustained improvement in asthma control for those with difficult asthma. We determined the effect of the assessment on spirometry and medication usage in children with PSA up to 6 yrs later. Data from children (aged 5–17 yrs) who underwent stage 1 assessment between the years 2005–2008 were analysed. STRA was diagnosed in those who progressed to stages 2 and 3 of the protocol in the 6-yr period. Skin-prick tests (SPT) to food and aeroallergens were performed at stage 1 . The sum of SPT wheal diameters for aeroallergens (cat, dog, house dust mite and grass and tree pollens) and food allergens (peanut, egg and milk) were used to quantify atopy . Height, weight, spirometry, exhaled nitric oxide fraction flow at 50 mL·s−1 (FeNO50), symptom control (Asthma Control Test) , asthma medications and number of oral corticosteroid (OCS) bursts in the previous year were obtained from medical records 1 and 2 yrs after stage 1. All data were within 9–15 months and 21–27 months after the initial stage 1 hospital visit and current data were at variable intervals (up to 6 yrs after the initial visit). Children still attending our centre (Royal Brompton Hospital, London, UK) were seen between February and May 2011 and underwent prospective follow-up assessments. The number of OCS bursts in the previous year was determined from patient records and direct questioning of the family. For patients no longer being seen by us, details of current medication and spirometry were obtained from primary or secondary care physicians. Current medication details were also collected by telephone interview. The study was approved by the Royal Brompton and Harefield NHS Foundation Trust and NHLI Ethics Committee. Differences between groups were assessed using the Mann–Whitney U-test and longitudinal data were assessed with the Wilcoxon matched pairs test using GraphPad Prism version 5 (GraphPad Software, San Diego, CA, USA). Regression analysis with robust variances was performed for the rate of change of forced expired volume in 1 s (FEV1) % predicted and daily inhaled corticosteroid (ICS) dose over time using Stata version 10.1 (Stata Corp., College Station, TX, USA). p<0.05 was considered statistically significant. 98 children underwent a stage 1 assessment between 2005 and 2008. 20 were excluded: eight because they had not undergone a home visit and 12 had already undergone invasive investigations. 42 (54%) out of 78 children progressed to stages 2 and 3 within 1 yr of stage 1. Nine out of 42 had all three stages pre-arranged because of recent life threatening exacerbations. The remaining 33 had either no modifiable reason for poor symptom control found at stage 1 or remained poorly controlled after stage 1 interventions. Five more children progressed to stages 2 and 3 more than 1 yr later. Therefore, up to 6 yrs after referral, 31 (40%) out of 78 children with PSA were classified as difficult asthma while 47 (60%) out of 78 had genuine STRA. The baseline characteristics of children with difficult asthma compared with STRA are summarised in table 1. Figure 1a illustrates the longitudinal change in FEV1 % predicted after stage 1. The difficult asthma group steadily improved over time, while the STRA group (fig. 1b) improved over the first year with a subsequent plateau. FEV1 % predicted improved by 2.6% (p<0.0001) per yr for all subjects, but the difficult asthma group had a greater improvement than STRA, showing an increase of 4% more than STRA (p=0.039) over the whole period. Mean forced expiratory volume in 1 s (FEV1) % predicted over time for a) difficult asthma (DA) and b) severe therapy-resistant asthma (STRA). Mean prescribed daily inhaled corticosteroid (ICS) dose over time for c) DA and d) STRA. Values shown are the mean with 95% confidence intervals. e) Median oral corticosteroid (OCS) bursts per yr for DA and STRA at 1 yr, 2 yrs and current (mean 3.9 yrs) follow-up. Children with difficult asthma were prescribed significantly lower ICS and had significantly fewer OCS bursts at all time points (fig. 1e). 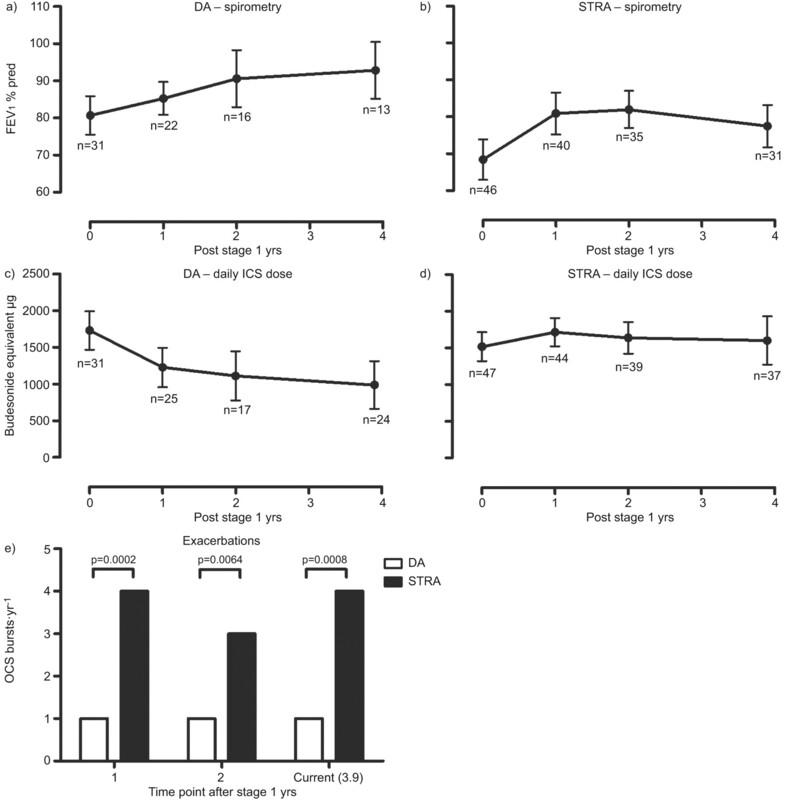 Longitudinally, daily ICS dose for children with difficult asthma reduced (fig. 1c), while children with STRA required increased ICS doses in the first year (fig. 1d). The difficult asthma group had a significantly greater dose reduction in ICS than STRA, with a difference of 431 μg (p<0.0001) between the two groups over the whole period. Both groups showed a similar improvement in symptom score between stage 1 and current follow-up. This is the first report of the long-term effectiveness of a staged protocol to investigate paediatric PSA [6, 7]. After stage 1, 40% of children with PSA did not need invasive investigations, and they had fewer exacerbations and improved lung function up to 6 yrs later, despite being prescribed lower doses of ICS. Difficult asthma and STRA have slightly different clinical characteristics ; STRA have worse spirometry, a greater family history of asthma, sensitisation to food and aeroallergens, bronchodilator reversibility and higher FeNO50. However, the considerable overlap between groups precluded using these markers clinically to differentiate difficult asthma and STRA in advance of the detailed assessment. Categorising children with PSA as either difficult asthma or STRA does not necessarily mean they will remain in that group. Among the 12 children excluded because they had already undergone invasive tests at the time of stage 1, eight were found to have potentially modifiable factors. Furthermore, at least 17 (55%) out of 31 of the difficult asthma group remained on ≥800 μg·day−1 ICS, thus remaining at risk of adverse effects. However, very few children initially considered to have difficult asthma were re-defined as STRA more than 1 yr after their stage 1 assessment, suggesting the original categorisation is reliable. Limitations to these data are 1) inclusion of a highly selected cohort at a tertiary hospital, 2) retrospective collection of longitudinal data, 3) loss to follow-up may have influenced the results since children who improved were discharged and 4) in the absence of a sham assessment (which would not be practical) we must be cautious in attributing benefits to the protocol. In summary, there is sustained benefit associated with a standardised protocol to assess paediatric PSA, particularly for children with difficult asthma. A prospective health economics analysis is needed since the use of specialist paediatric nurse time during the stage 1 assessment is substantial. However, the savings made by avoiding an in-patient stay for unnecessary invasive investigations are considerable, and the benefit of achieving better asthma control with simple interventions likely outweigh their cost . We are grateful to W. Banya (Medical Statistician, Royal Brompton Hospital, London, UK) for help with statistical advice and testing. A. Gupta has been the recipient of a British Medical Association James Trust Fellowship (£41,000) and travel to the 2010 ERS congress was funded by the Asthma UK travel fellowship. S. Saglani is supported by a Wellcome Trust intermediate clinical fellowship, grant number: 083586/Z/07/Z.
. Severe childhood asthma: a common international approach? Lancet 2008; 372: 1019–1021.
. Problematic severe asthma in children, not one problem but many: a GA2LEN initiative. Eur Respir J 2010; 36: 196–201.
. Identifying problematic severe asthma in the individual child – does lung function matter? Acta Paediatr 2010; 99: 404–410.
. Phenotype-specific treatment of difficult asthma in children. Paediatr Respir Rev 2004; 5: 116–123.
. Assessment of problematic severe asthma in children. Eur Respir J 2011; 37: 432–440.
. The importance of nurse-led home visits in the assessment of children with problematic asthma. Arch Dis Child 2009; 94: 780–784.
. Management of severe asthma in children. Lancet 2010; 376: 814–825.
. Quantification of atopy and the probability of rhinitis in preschool children: a population-based birth cohort study. Allergy 2007; 62: 1379–1386.
. Development of the asthma control test: a survey for assessing asthma control. J Allergy Clin Immunol 2004; 113: 59–65.
. The costs of asthma. Eur Respir J 1996; 9: 636–642.